When people recognize the extent to which debt restricts their capacity for living a full and meaningful life they often focus on paying off debt to the exclusion of everything else. A more balanced debt management approach allows you to pay down debt and enjoy life at the same time. For that reason it is worth taking time to consider some of the ways we need to relate our debt reduction program to other aspects of our financial program. With this more balanced approach we are much more likely to be successful. Getting rid of debt is not your only high priority goal, but little is more important than your need to pay down debt either. Don’t lose site of it’s role in your financial life. But look at the whole picture as well. This is critical. Financial independence in your life becomes possible when passive income (money that comes in without your continuing to work for it) is enough to cover your expenses. Debt is a key factor in the equation. You can plan for financial freedom by increasing passive income, adding to your IRA and other investments for example. But the amount of income you will need to live independently depends largely on your living expenses. If you could eliminate today all your credit card bills, your car payments, your personal loans and your home mortgage, how much would your cost of living decrease? How would that impact your life? Look at your personal expenses. If you could eliminate today all your credit card bills, your car payments, your personal loans and your home mortgage, how much would your cost of living decrease? How would that impact your life? Lowering your cost of living is just as important as planning for permanent income. There are numerous things you can do to reduce your cost of living. The truth is, however, paying off debt is one of your largest considerations in reducing monthly expenses. 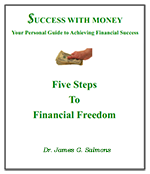 Debt elimination relates directly to preparing for old age, or earlier retirement, as well. When you get rid of debt you free up additional money for investment. The more you can invest monthly, the sooner you will become financially independent. It is easy to rationalize debt. But in the long term there are no acceptable debts. Are some debts unavoidable? Possibly, at times. But don’t accept any as being an inevitable necessity. Consumer debt is totally unnecessary and should always be avoided. Not only that, these debts typically call for higher rates of interest. That is why credit card debt and personal loans generally need to be paid off first in your debt pay off program. Your overall debt management plan calls for learning how to finance such purchases with cash. With proper planning even larger purchases such as automobiles can be paid for without borrowing money. Debts such as those for education, medical bills, and a home may be temporarily justified. But these should be eliminated as quickly as possible. One of the tragedies faced by many people today is that they get too old to continue working but still owe money on their home. There are many explanations for this but none of them pay the bills. A common suggestion that many professionals suggest is to keep your home debt for the tax deduction and invest your money in higher paying income opportunities. I disagree totally. How many people are trapped in homes they cannot afford to keep and cannot sell today? Where can you guarantee a greater income than the interest rate you are paying? Could you pay your mortgage payments if you lost your job today? What happens if you reach retirement age and still have payments? How much easier would your life be today if you had no house payment? I could go on with many more points, but the thrust is clear. Even if you can technically show a possibility for coming out a few dollars ahead, mortgage debt is not a good idea if you can avoid it. There is an old saying, “All work and no play makes Jack a dull boy.” If you focus too much on debt elimination you can make life pretty unpleasant. Fortunately you can be completely successful paying down debt in a reasonable period of time without making yourself miserable. This is the primary reason that I recommend starting your debt pay off plan paying only the amount you are obligated to pay already, at least for a short time. (Remember you don't reduce your total payments as balances decrease). After you have adjusted to paying this same amount on your debt each month you can free up and add other funds to help pay down debt. A sensible approach to debt elimination can best be seen as part of a balanced approach to financial management. A sensible approach to debt elimination can best be seen as part of a balanced approach to financial management. It is not the whole story, just a part. The key to maintaining a balanced approach to your finances in general is to see it as part of maintaining a balanced life overall. In short this means you don’t have to eliminate your vacation in order to eliminate your debt. You may need to make different choices about what to do so you incur no debt, but you don’t need to cut it out altogether. Debt elimination underway or not, no one should be making financial choices that are beyond their resources. That kind of thinking is what gets people into trouble in the first place. If eating out is important to you, don’t give it up altogether. Just plan to pay for it. That is your new way of living and it is a better, happier way. And believe me. If you pay for it with cash instead of a credit card it will taste better, too. Choose to do things you can pay for instead of borrowing. But do some of the things you enjoy. It is better to take a few extra months paying off your debts than to make getting out of debt so miserable you give up on the whole project. Paying off debt is not the only important part of your financial plan. At the same time, to pay down debt with an effective debt management program is one of the essentials. In our final article of this series, Maintaining Drive and Enthusiasm, we will talk about ways we can stay excited about our debt free project until success is complete.